Father: Junius Leigh Walthall, a native of Virginia, former Captain in the Confederate Army, involved in Alabama politics. Natalie Walthall, born 18 March 1872 at Mallory Station, Shelby County, Alabama. She married William Jackson Ashton 7 March 1900 and is buried in Birmingham, Alabama. Henry Brazeal Walthall, born March 16, 1878 at Mallory Station, Shelby County, Alabama. He married Mary Charleson. He was educated at home under the tutelage of two aunts, Miss M. Mallory and Mrs. W. W. Wallace. He attended Howard College at East Lake, Alabama. In 1900 he went to New York City where he played in stock companies both there and on the road for 8 years. In 1898 he volunteered and served as private in Co. G, First Alabama Reg., in the war with Spain. After the cessation of hostilities he went to England with Mr. Miller in the production of "The Great Divide." On his return to the U.S. in 1910, he entered the motion picture field with David Wark Griffith. Among his screen successes are "The Birth of a Nation" in which he played the Little Colonel, "The Avenging Conscience", etc. His daughter Patricia, who was a film actress for a brief time, married Mario Cueto on 13 March 1941 in California but moved to Argentina (his home) where her family now lives. She had two children and four grandchildren. Wales Wallace Walthall was born 12 March 1881 in Mallory Station, Alabama. John Mallory Walthall was born 12 April 1882 in Mallory Station, Alabama. Arizona. From Picture-Play Magazine September 1918. 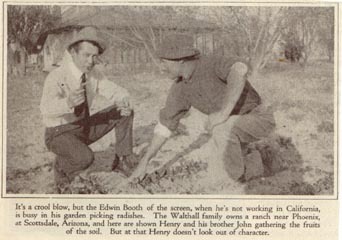 Hugh Partridge Walthall was born 1 December 1885 in Mallory Station, Alabama. Junius Leigh Walthall, Jr. was born 27 January 1888 in Mallory Station, Alabama. he's the fellow on the left. 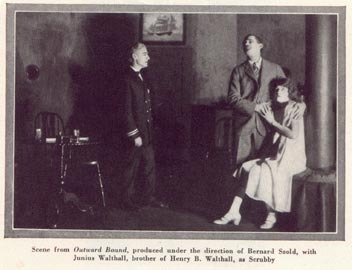 From Theatre Magazine February 1926, pg. 41. Anna May Walthall was born 3 October 1890 in Mallory Station, Alabama. Married Luther Osgood Eldridge. She died 17 April 1950 (the same day her sister, Natalie Walthall Ashton, died in Birmingham, Alabama). She is buried in Valhalla Cemetery, Burbank, California. She was for a period of time in motion pictures. She had one son, Luther O. Eldridge, Jr., and two granddaughters - all living in California. Elizabeth Walthall born 4 January 1894 in Birmingham, Alabama. She married Malcolm Lide. Thanks to Elizabeth Walthall's granddaughter Linda for the above information.